The agricultural sector continues to feel the effects of the devastating drought but has shown signs of growth in some areas of the Western Cape in 2004-15. This is according to the latest provincial and municipal economic outlook report tabled in the provincial legislature by Western Cape Finance MEC Ivan Meyer at the weekend. 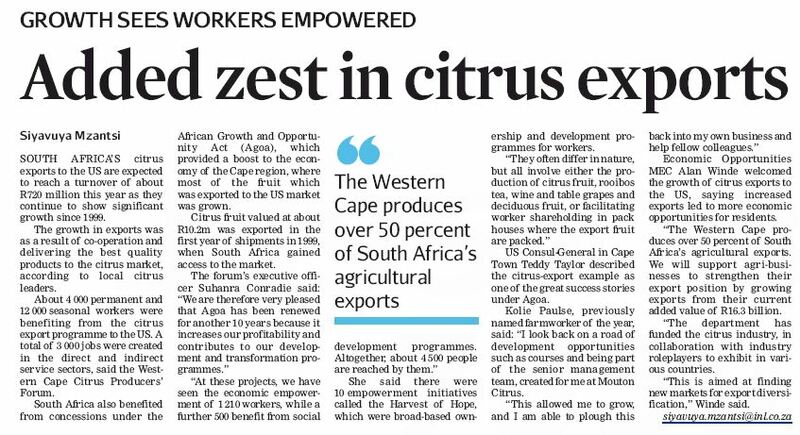 The report shows that the West Coast and Cape Winelands districts have caught up with the traditional fast growing regional economies such as the Eden and Overberg districts. The West Coast and Overberg districts, for example, grew on average 3.9% between 2004 and 2015, while the Cape Town Metropolitan area grew on average 3.1% over the same period. The growth outlook for the South African economy remains pessimistic. Economic growth in the Western Cape, SA’s second wealthiest province, had slowed to 1.4% in 2015 from 2.1% in 2014, and would remain constrained over the short term, Meyer said. Meyer said looking ahead over the next five years, the finance, insurance, real estate and business services were expected to grow 3% on average across the province.